A global program to bring education to disadvantaged children in the form of portable computers was an important lesson learned regarding the use of technology for community development. One Laptop Per Child initiative sounded like a feasible way to place access of the worldwide web in the hands of these children to further their knowledge. The only problem was, the project designers didn’t anticipate that instead of students improving test scores as a result of access to study materials on the computer, their families opted to use them as alight source while cooking at night. The lesson learned here? Namely, that greater emphasis must be placed on understanding community needs prior to rolling out $100 laptops to poor families. Innovation in technology has the potential for powerful impact and replicability of development projects. Yet, initiatives with information and communication technology (ICT) components often fail to meet program objectives. In an increasingly connected world, the failure of getting these projects right means women-led businesses aren’t created, fish are not sold at market price resulting in hungry families, and millions of development dollars and effort are wasted. However, there are worthy ICT projects. I will describe some ICT projects, the main challenge in ICT for development and how we got to there, and recommended actions the international development community should take to ensure success. ICTs for development apply infrastructure and services to support social, economic, and political development of poor and marginalized communities. This includes everything from voice communications, and mobile phone technology, to investment in broadband and regulatory policy development. Organizations have prioritized ICTs in their programming for projects like smart phone applications to track human rights violations and SMS messaging to measure immunization coverage and to send health-related reminders. The World Bank has prioritized the ICT sector, specifically in the area of access in its 2012-2015 strategy, targeting about $875 million in investment lending. This increase in ICT investment among many aid organizations sparked debate about the challenges like the one laptop per child project. We learned from pioneering projects and thoughtfully analyzed how to adapt. Another example that’s often credited for its success, the South Indian Fisherman experience, sought to implement a mobile phone project connecting fishermen to market prices in order to increase profit. Unfortunately, it was difficult to assess whether the phones had direct impact on the livelihood of fishing communities. For example, many of the fishermen prefer radio broadcast for communication because the cell phone range won’t reach. These innovative tools, which by all accounts could have been solid responses to development challenges, were not widely adopted because implementers failed to analyze the social and cultural environment and the needs of the user in the community, with the user. Luckily, it seems developing with the user, or user-led (UX in tech speak) is now a given in the development community for ICT. In my work at the Inter-American Foundation (IAF) to develop the web-based platform RedColaborar, for learning and collaborating among our grantee partners, I have followed the UX approach. I reach out to the development community when I encounter technical challenges and have found these spaces as invaluable input to my work. I recently participated in a small roundtable hosted by TechSalon to discuss how to bring stakeholders into the ICT design process. In June more than 300 experts in agriculture and technology convened to share the most innovative ICT interventions in smallholder agriculture projects at the ICTforAG Conference. They showcased exciting work like mobile money, drones and spectral sensing, the gender gap in technology, and blockchain — an incorruptible digital ledger of economic transactions. Although we correctly identified the user-led methodology, it seems ICT projects continue to fail. Why can’t the development community walk the UX talk? Donor organizations weren’t designed that way and many lack experience in community-based development. The immense structure, bureaucratic processes, and time required to implement get in the way of successful and agile ICT projects. There are steps we could take such as procurement reform, simplified security and privacy protocol tools like GSA’s LTO, and carrying out user research on the front end before the project. The most important factor, though, comes down to a well-established relationship and trust between the community and the donor. The IAF is well-positioned to carry out these projects because the essence of our work is user-led, responsive, and agile. The IAF’s approach over 40-plus years has resulted in strong bonds with thousands of resilient groups in Latin America and the Caribbean. They are the innovators, the business starters, and the experts in their approaches to development challenges. Access to this network has been an asset to our project. 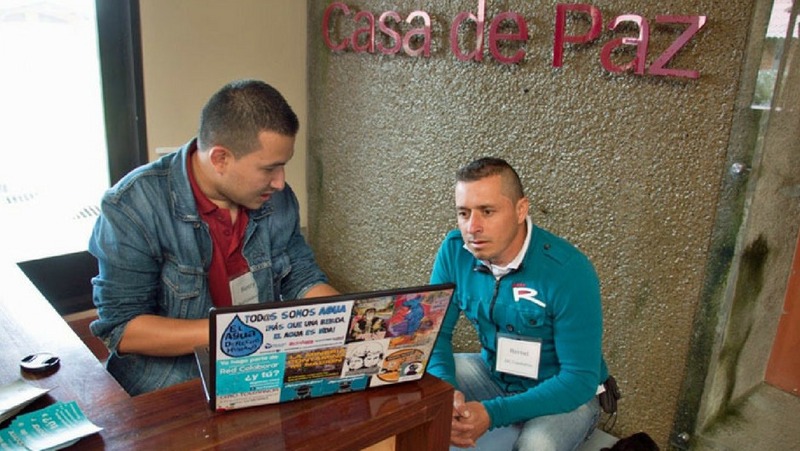 We tested our prototype with IAF grantee groups addressing agroecology, youth, and the peace process in Colombia, culminating over 600 collaborators on our test site. They provide honest feedback and are open about their daily challenges. We selected community managers from these organizations to interview users, test usability, and help develop a more finalized platform. Community manager Lila Almendra of Brazil attended an agroecology event in March to test the prototype and facilitate large group discussion around using the platform as a resource for sharing expertise. The community manager strategy has helped our team focus even more in user needs. ICT for development is not a one size fits all, and this is especially challenging for an organization like the IAF. Our user group is diverse in internet accessibility, equipment preference, development objectives, language, regulatory landscape, privacy needs, and digital literacy levels. They comprise some of the most non-traditional and hard-to-reach users of ICTs in the region. The power of the IAF network and our donor-grantee trust has been the defining factor in the success of the platform, but for other challenges I reach out for well-informed guidance from specialists in NGOs, academia, U.S. government, businesses, and other experts. The development community must come clean about its UX approach in ICT projects. Ticking the boxes on the digital development principles checklist won’t cut it unless we are doing it with project beneficiaries and community members. The large institutions with technical expertise lacking close ties to end users should partner with those that do and who could benefit from their technical expertise. We should investigate co-funding structures that provide for a more agile response. If we are open about our weaknesses and pool our strengths, we will have more successful ICT project outcomes.